Turkey is gearing up to launch what has been billed as the world’s first all-electric tug, reliant solely on battery power for bollard pull. 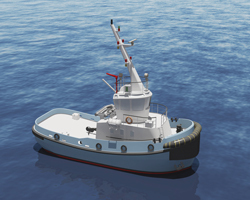 As of late October 2018, the first-in-class example of the anticipated Zero Emissions Electric Tug, or ZeeTug for short, was nearing completion at Navtek Naval Technologies’ Istanbul yard, which has confirmed that it is on track to deliver the newbuild in early 2019. The completed ZeeTug, or Navtek design NV-712, will mainly operate inside the Port of Istanbul, under the operation of GİSAŞ Shipbuilding Industry Co, whose commercial spread also includes the provision of port services within this zone. The newbuild will also be able to conduct emissions-free tasks in the Sea of Marmara. The ZeeTug has been custom-designed to meet GİSAŞ’ specific operational requirements: as Navtek vice chairman of the board Orkun Özek has previously put it, the tug “is small, and will work in a very narrow and tight environment, which is why we opted for a fully electric, battery-powered propulsion system rather than a hybrid solution”. Fatih Dönmez, Navtek technical manager, tells Ship & Boat International: “GİSAŞ is planning to replace four of its existing tugs with ZeeTugs,” thus signalling a long-term commitment towards curbing emissions in and around the Tuzla ports zone. The 18.7m newbuild is being equipped with a Corvus Orca energy storage system (ESS), comprising two battery packs manufactured by green craft tech specialist Corvus Energy. Featuring a total energy storage capacity of 1,484kWh, the ESS will feed two 968kWe Siemens propulsion motors using fixed-pitch propellers. ABB has been contracted to provide the thrusters and drive systems. Assembly of the combined propulsive package has been overseen by Turkish marine systems integrator BMA Technology, which has also provided a back-up alarm monitoring and control system. “ZeeTug will undertake harbour towing duties during day time and will be recharged overnight,” Dönmez explains. “One charging per day, via shore-side connection, is enough for the operator’s operational needs.” He estimates that, in its current environment, ZeeTug’s batteries can be fully charged within an hour – though, depending on the shore-side connection capacity, this time could be reduced to half an hour with the same battery arrangement (in other locations, for example). Also, as Corvus Energy points out, while it is relatively easy to predict charging periods and consequent operational range for ferries and passenger vessels undertaking fixed, regular routes, the flexible and varied nature of tug work makes it harder to establish a ‘concrete’ figure when it comes to charge times and energy usage. The vessel will accommodate up to four crew members and feature a towing hook capacity of 31tonnes bp.